Helicoil inserts are available in thread repair kits and sets for repairing tapped holes which have been stripped or damaged due to wear, corrosion and overtorque. They are available in inch, metric, spark plug and pipe thread series. 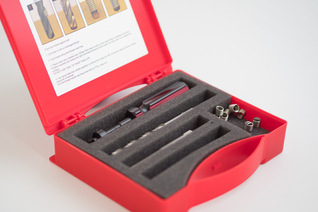 All kits have a quantity of inserts, the proper size drill, high speed steel Helicoil tap and an installation tool. The Professional Kits* (shown in bold type) also includes a tang removal tool and quantities of three lengths of inserts. All sets contain a drill, tap, tool and inserts for each size listed above. 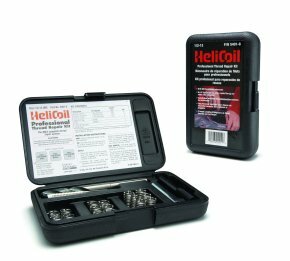 See Helicoil Bulletin 998 for a complete listing of all Helicoil thread repair products.